We should never limit our capacity to learn to the four walls of a classroom. Skilled professionals and licensed instructors are always open to sharing their knowledge and experience for the benefit of their community. 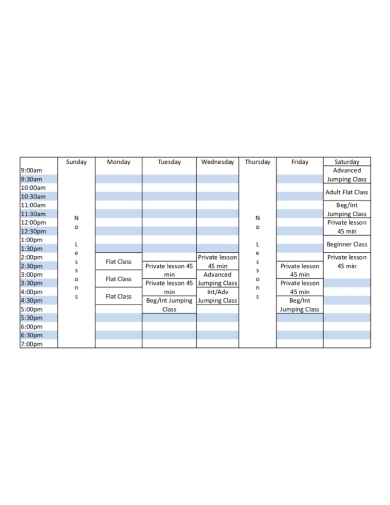 When organizing special classes, training programs, and workshops for willing participants, you can communicate your available time and dates through a lesson schedule. The schedule will also be used to inform participants of the topics to be covered during the given session. Beach tennis is a type of sport that combines the elements of tennis and volleyball into one. Because this sport is new and unfamiliar to most, lessons are offered by various groups to teach participants about the mechanics of the game. 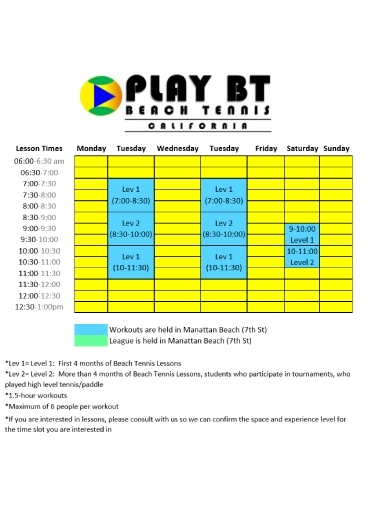 Shown above is an example of a beach tennis lesson schedule provided by Play BT to those interested. Different levels of the class are also indicated for people to know which category they belong to and which sessions to attend. The time and location of the classes offered will be useful for registrants who aren’t quite familiar with the area. The holiday season can get pretty hectic for most people. This is also when time schedules tend to change to cater to the needs of students and their instructors. When this happens, an announcement for a temporary change in schedule is posted beforehand to avoid problems that are relative to the matter. 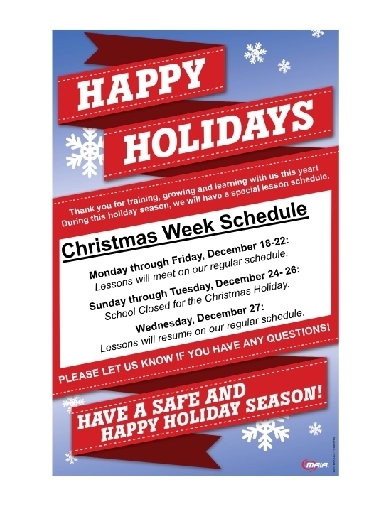 The special lesson schedule will be slightly different than the usual arrangement, with the institution likely closed for the Christmas holiday. 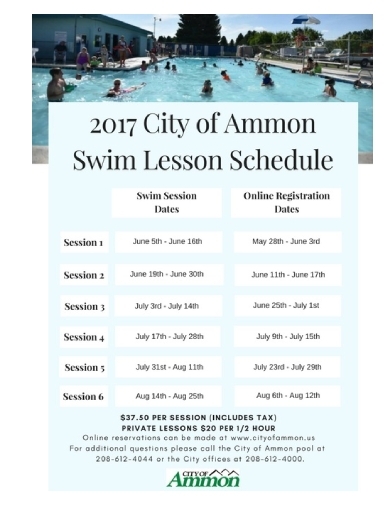 Most cities offer swimming lessons to locals as part of their enrichment program for the youth. If your community happens to offer these services, you’ll likely find the lesson schedule to these classes in your community center or town hall. The schedule should contain the dates and registration costs for each session. Since classes are usually held over the summer, clients won’t have to worry about school or poor weather conditions interrupting the intended schedule. Also, contact details for reservations must be specified to answer common questions from participants. It’s not unusual for a school to offer special classes and tutorials to students who are struggling with their academics. Extra lessons are usually offered during the weekends to assist students and make sure they don’t fall behind the rest of their classmates. 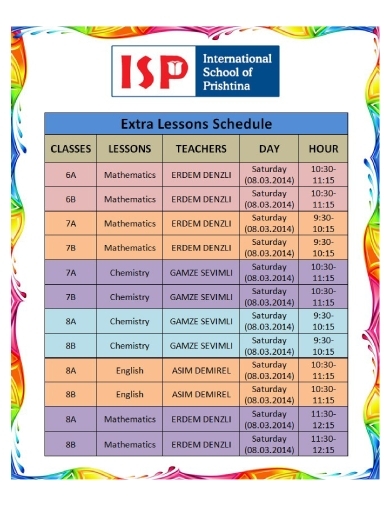 A lesson schedule for the class is given to show which subjects will be taught and by whom. Students can register for the subjects available by using the schedule as a reference to avoid conflict. Who said lessons were only meant for the human race? These days, you can enroll your pets for training programs with a licensed instructor. Happy Horse Of Course, for example, is an organization that trains horses and their owners the basics of natural horsemanship and groundwork. Finding a place that offers such services is pretty rare, so you want to make sure your lesson schedule is publicly posted for clients to be informed. A lot of people learn martial arts as a means of self-defense. If you’re considering about taking classes, you need to make sure your personal schedule can handle it as slots tend to fill out quickly. 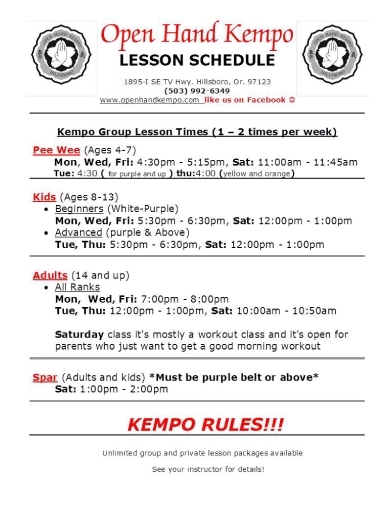 The lesson schedule of schools like Open Hand Kempo showcases the sessions available for students of different age groups. This would also depend on the student’s rank when he or she began training. Further details for the group and private lessons are also provided upon inquiry. Music lessons are good for children who have an ear for music and wish to explore their talents. 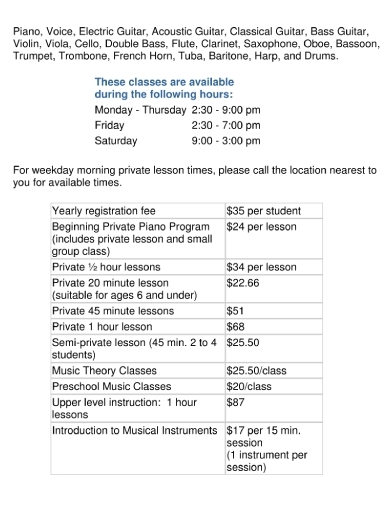 If you happen to offer these services, be sure to have a lesson schedule prepared. Your class list must also be noted in the schedule for reference. It’s best to include a price menu so clients know which classes they can take according to their allotted budget and preference. There are many toddler and pre-nursery programs designed to expand the minds of children from an early age. These lessons are developed to cater to the needs of parents who might not have the time in their hands to support this aspect of their child’s life. For companies that offer these types of programs, it’s a good idea to make a detailed schedule that features your offered lessons that parents can evaluate and decide on. 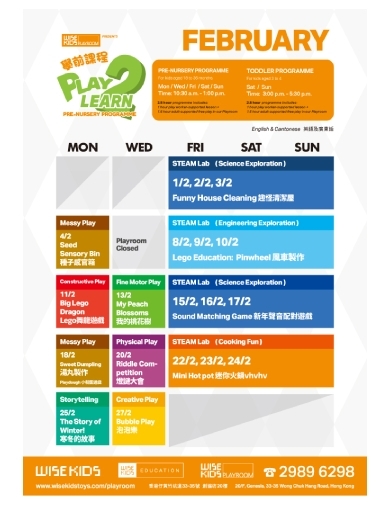 The lesson schedule may be used as an advertising poster to promote your services as well. Most resorts and swimming centers have strict policies against unsupervised children who swim in pools that are twice their height. One way to avoid a tragic accident from happening is to enroll your child in a swimming class at your local sports center. 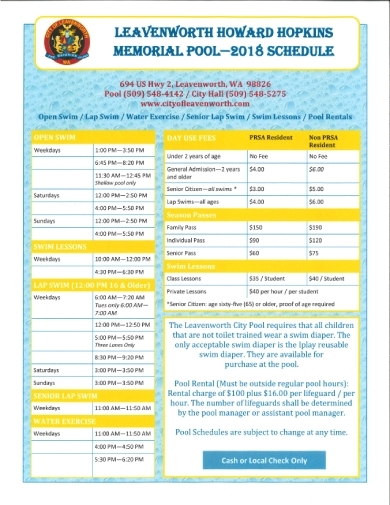 Swim lessons are often posted along with the daily schedule of the center’s pool services. If you’re responsible for making a chart for these schedules, make sure to keep information as organized as possible to avoid confusion. There are certain skills that require the assistance of a competent instructor to learn. Thus, workshops are often made available to help people master these abilities. 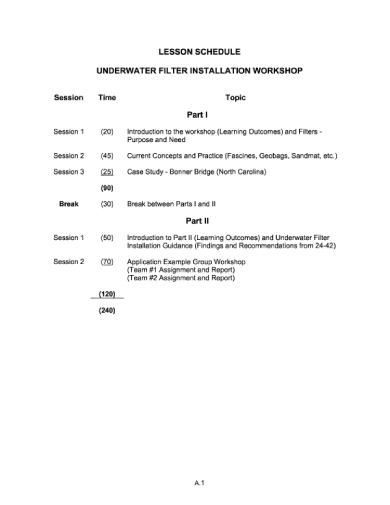 One example would be the Underwater Filter Installation Workshop directed by the National Academies of Sciences, Engineering, and Medicine. This provides guidance on design procedures, material testing requirements, and other essentials that professionals need to learn as service providers in the community. Like a lesson plan, the schedule of these workshops also specify the topics to be discussed during each session.